I think it is an artocarpus from Thailand. Tree is huge. Fruits are round, small and yellow. Can't remember the name. Here are some fruits collected this morning. 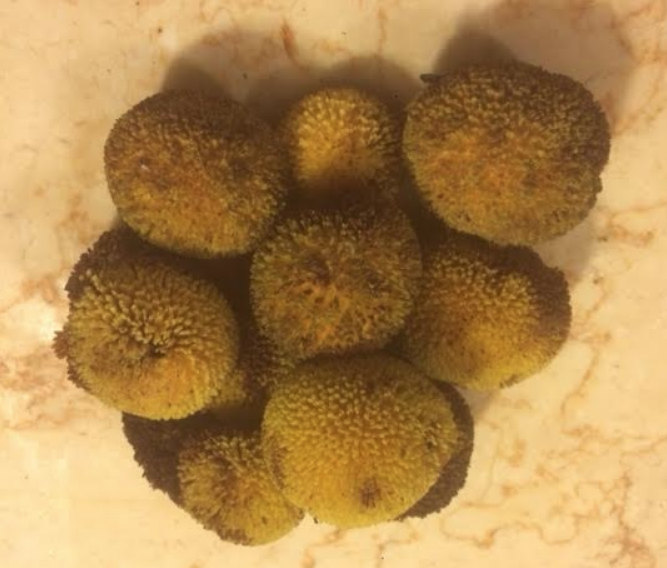 Maybe artocarpus hirsutus, wild jakfruit. nope too small for hirsutus. The largest ones are about the size of a ping pong ball. It is Bombax Ceiba which distributes in Thailand, Lào, Campodia and several more countries in SE Asia. Thanks for the comment but I checked on google and pictures of the fruits/trees I have found are quite different. I don't think it is bombax ceiba. I wrote the wrong name. It should have been "Nauclea cadamba". yep exactly. Thank you so much for your help. How do you multiply that tree ? any seeds ? fruits ? i could not find any seeds into those supposed fruits. Actually I reckon those yellow ping pong balls are not fruits but flowers ? right ?